–Doji Hotaru, "Her Father's Daughter"
All eyes are on the Scorpion. They have found themselves in the center of the Emperor’s favor, and the courts of Otosan Uchi are filled with the red masks of the duplicitous clan. But as the Scorpion exhibit strength, they also reveal their weakness. The Great Clans have become accustomed to the Scorpion's ways, and each has their own methods of dealing with the clan. 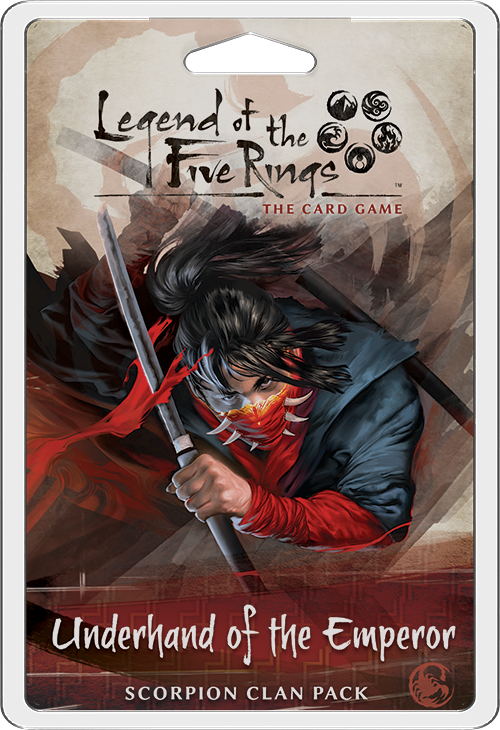 Join us today as we preview the rest of the non-Scorpion cards found in Underhand of the Emperor, a new Clan Pack for Legend of the Five Rings: The Card Game! Though Clan Packs traditionally focus on one clan, the other six Great Clans each receive one new character meant to deal with the Scorpion strategies introduced in the pack. 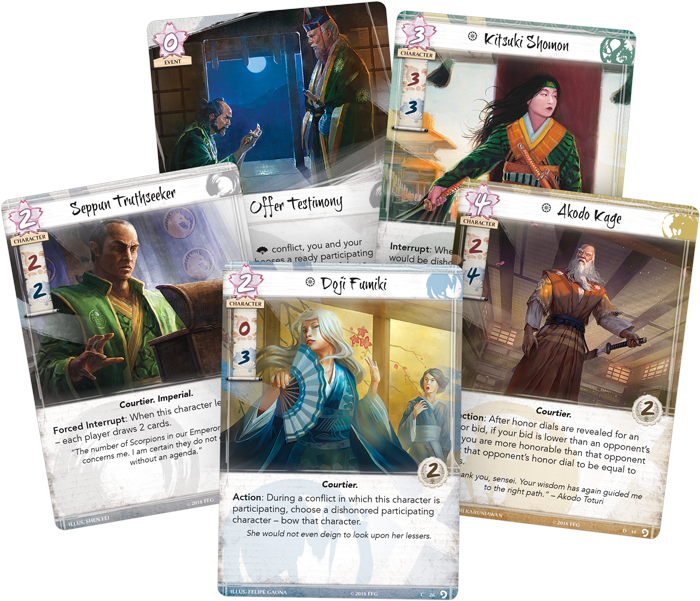 We’ve already seen the Lion, Phoenix, and Unicorn cards found in Underhand of the Emperor, and today we’ll look at the Crane, Crab, and Dragon characters! As a straightforward and stoic clan, the Crab may seem to be an easy target for the Scorpion’s machinations. However, there is a wisdom in their duty. No one is as shrewd as a Yasuki, and they will not bow so easily to the Scorpion’s tactics. Watch Commander (Core Set, 133) is a powerful tool against the Scorpion, punishing them an unlimited number of times for playing a card during a conflict. Underhand of the Emperor introduces Yasuki Oguri (Underhand of the Emperor, 12), a dynasty character who works in a similar manner. Whenever Yasuki Oguri is defending a conflict, he gets an additional military and political skill whenever your opponent plays an event! The Scorpion will consistently play events to get the upper hand in conflicts, but now they must contend with Yasuki Oguri as well. This may even offset many Scorpion events—for instance, with only one glory, dishonoring Oguri using an event is fruitless, as his skill will simply even out for the rest of this conflict. 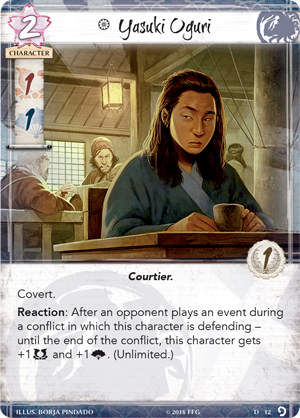 Your opponent will also have a hard time slipping past Yasuki Oguri, considering he has the covert keyword. This can also be used as an offensive tactic to get around your opponent’s heavy-hitters, should you feel the need to be more aggressive. 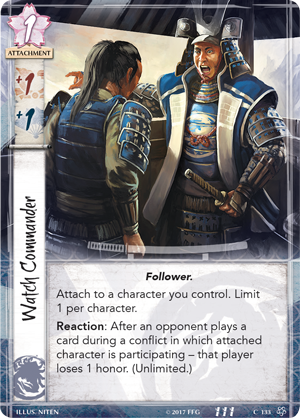 Regardless, your opponent will be hesitant to unload their events during a conflict with Yasuki Oguri on the field, especially if he has a loyal Watch Commander by his side. The Scorpion’s relationship with honor is tenuous. Should you become mixed up with the Scorpion, you run the risk of being dragged down with them, finding your honor dwindling and your characters in a dishonorable state. You can often feel like you’re losing control of your clan and bending to the Scorpion’s will. However, the Dragon are beyond such worldly trappings. 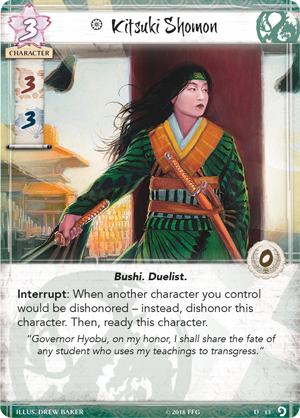 Kitsuki Shomon (Underhand of the Emperor, 13) is a three cost Bushi Duelist who is the perfect ally in your fight against the Scorpion. With zero glory, Shomon receives no skill penalty for being dishonored. Furthermore, whenever one of your other characters would become dishonored, you may instead dishonor Kitsuki Shomon and ready her. Suddenly, you're actively searching for your characters to be targeted by the Scorpion’s dishonor, making the Scorpion much more wary of dishonoring your characters. Furthermore, with three military and three political skill, Shomon is valuable in any conflict. With a tsunami devastating a majority of their land, the Crane are in dire straits. Noticing that the Crane’s attention is focused inward, the Scorpion have seized the opportunity and displaced the Crane Clan in the Emperor’s courts. However, the Crane will not go down without a fight, and they still have weapons to fight against the Scorpion. The Scorpion not only focus on dishonoring your characters, but their own characters as well. 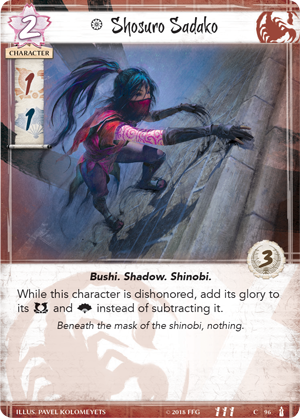 Cards like Shosuro Sadako (All and Nothing, 96) thrive on being dishonored. The Crane, however, understand the importance of honor, and they can cast down those who sink to new lows. 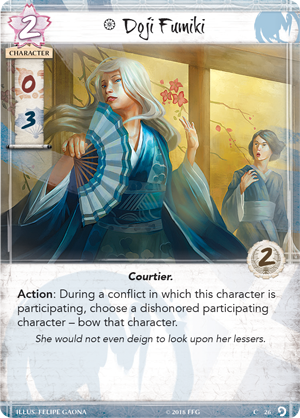 Doji Fumiki (Underhand of the Emperor, 26) is just one example of the Crane's ideals, as a two-cost Courtier who can bow a dishonored character during a conflict she's participating in. While Sadako may have a massive amount of skill while dishonored, it matters little when Doji Fumiko is in the conflict. 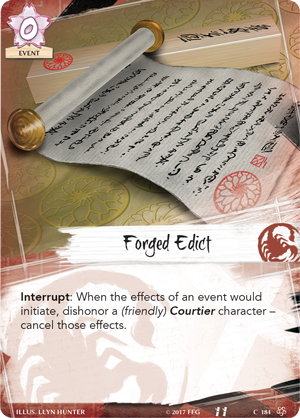 Not only can she contribute her three skill to a political conflict, but the Scorpion may be hesitant to use cards like Forged Edict (Core Set, 184) if it means the dishonored character will find themselves bowed. And although Fumiki has zero military skill, she can still use her ability in a military conflict, potentially circumventing a dangerous character. The Scorpion are in the spotlight, and each clan must deal with this threat in their own way. Underhand of the Emperor delivers a new character for every clan, but with a monumental edict for Emperor Hantei XXXVIII, the Scorpion are about to ascend to new heights of power. Join us next week for a new piece of web fiction, and next month for the release of Underhand of the Emperor! Discover the Scorpion’s power in Underhand of the Emperor (L5C15), available now for pre-order from your local retailer or our website!